"Fiat iustitia ruat cœlum". Let justice be done though the heavens fall! — Lord Mansfield, from ancient maxim. An unconstitutional act is not a law; it confers no rights; it imposes no duties; it affords no protection; it creates no office; it is in legal contemplation as inoperative as though it had never been passed. — Norton v. Shelby County, 118 U.S. 425 (1886). Landmark Court Decisions — Local archive, with commentaries on the rulings and the opinions. U.S. and State Reform Gateway — Collection of links to legal reform organizations and activities for the U.S. and each state. The Constitution in Exile — Collection of documents and links to writings that focus on this movement. State Bar Reform — Problems with state bars and what to do about them. Law Libraries — Scholarly articles, federal and supreme court decisions, and legal briefs. Woe unto you also, you lawyers! For you load men with burdens hard to bear, and you yourselves do not touch the burden with one of your fingers." Wearing black robes doesn't make fools wise. Bouvier Law Dictionary. Also available as two self-extracting executables: Part 1 and Part 2. Pro Se Handbook — Local copy of guide available from here. Points of Rebellion, by William O. Douglas — Supreme Court justice reveals the breadth and depth of official corruption and abuse of constitutional rights and limits on powers. Woe Unto You, Lawyers, Fred Rodell, Professor of Law, Yale University, 1939 — Criticizes the legal profession. Wikipedia Articles of Interest. Check these for fidelity to their subjects. National Association of Criminal Defense Lawyers (NACDL) — Have legislative reform agenda. Paul Velte, constitutional attorney — Also has an organization, Peaceable Texans for Firearms Rights. Has served on Committee of Safety of the Southern Region, Texas Constitutional Militia. Citizens' Justice Programs — This archive of articles by constitutional attorney David C. Grossack includes some useful guidance for legal reformers. Tenth Amendment Center — Effort in many states to challenge unconstitutional federal overreaching of its authority. WordPerfect Non-Standard Point Size to Standard Point Size Conversion Chart — Needed to comply with Rule 33.1(b) in filings to the U.S. Supreme Court. Qui tam, abbreviation of "qui tam pro domino rege quam pro sic ipso in hoc parte sequitur", meaning "who sues for the king as for himself." Black's Law Dictionary defines a qui tam action as "an action brought ... under a statute which establishes a penalty for the commission or omission of a certain act, and provides that the same shall be recoverable in a civil action, part of the penalty to go to any person who will bring such action and the remainder to the state or some other institution." Ex Rel., abbreviation of "ex relatione", are actions brought in the name of the state but on the information and at the instigation of a private individual with a private interest in the outcome. The real party in interest is called the "relator." The action is captioned "State of X [or United States] ex rel. Y. v. Z." Quo warranto, "what authority? ", is an ancient legal doctrine by which persons may challenge actions of governmental or corporate officials or agents when they exceed their legally granted authority. It may be used to remove the offender from office. Habeas corpus, "have the body", a kind of quo warranto action seeking to release someone from custody if the authority to hold him cannot be proven. Brief on Private Prosecutions — Provides cites for recent cases involving use of private prosecutors. Addressing the Constitutionality of the Independent Counsel Statute: Executive Control over Criminal Law Enforcement: Some Lessons from History, Harold J. "Hal" Krent, 38 Am. U.L. Rev. 275, Winter, 1989, — Interesting review of private criminal prosecutions in history. Notes on quo warranto proceedings — Provides cites for recent cases involving use of quo warranto. Money Matters — Constitutional issues involving money. Tax Matters — Constitutional issues involving money. Montana Freemen Archive — This is the documentation developed by the Freemen of Justus Township, Montana, who began an armed confrontation with state and federal personnel in March, 1996. Is there merit in their position, or are they out of line? You decide. These are Microsoft Word .doc files, courtesy of Patrick Lear. Dulocracy in America, by J. D. Sweeney — New edition of the original three volume treatise on the political and judicial history of the United States, heralding its decline in the 1930's from a nation under law to a welfare farm ruled by public servants operating under the guise of perpetual "economic emergency." Focus is on the Commerce Clause and how it has been used as the basis for usurpations of power by the central government of the U.S. There's no way to rule innocent men. The only power government has is the power to crack down on criminals. When there aren't enough criminals, one makes them. One declares so many things to be a crime that it becomes impossible for men to live without breaking laws. 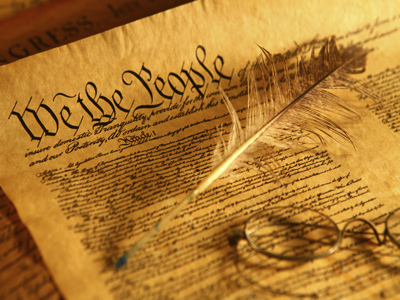 One of the key issues in the interpretation of the U.S. Constitution is the definition of the term "regulation". According to Black's Law Dictionary (Sixth Edition), a regulation is "a rule or order prescribed for management or government; a regulating principle; a precept." It is usually understood today as a "rule of order prescribed by superior or competent authority relating to action of those under its control. Regulation is rule or order having force of law...." and a function of a government. But in its original meaning, current at the time the U.S. Constitution was adopted, it included self-regulation, not just regulation by a government. The controversy, which arose soon after adoption, is whether the power to regulate includes, as a "necessary and proper" power (Art. I, Sec. 8, Cl. 18), the power to impose criminal penalties, or only civil penalties. The understanding of Jefferson and Madison, and many others of the Founders, was that it did not. See the Kentucky Resolutions of 1798 and the essay "Federal Criminal Powers Limited". However, later generations have departed from that understanding, and, in combination with the "commerce clause" (Art. I, Sec. 8, Cl. 3), extended federal criminal jurisdiction to anything having a "substantial effect on interstate commerce", especially after the appointment of compliant judges to the U.S. Supreme Court in 1937. There is also an issue arising from the practice of the U.S. Congress of adopting general legislation and delegating to executive agencies the power to promulgate "regulations" to define the details of such legislation. But, those "details" often amount to substantive law never contemplated by the U.S. Congress, and constitute an unconstitutional delegation of legislative power to an executive department, something forbidden by the U.S. Constitution and a violation of the principle of the separation of powers it enbodies. The reversal of these usurpations is a focus of efforts to return government to compliance with the original intent of the Founders. Uncertainties of the Income Tax — Brief by Larry Becraft. You might be able to use this in your tax case. Also see the following letters that you might use as a model. According to Black's Law Dictionary (Sixth Edition), bills of attainder are "legislative acts, no matter what their form, that apply either to named individuals or to easily ascertainable members of a group in such a way as to inflict punishment on them without a judicial trial. ... An act is a 'bill of attainder' [under common law, see Blackstone's Commentaries] when the punishment is death and a 'bill of pains and penalties' when the punishment is less severe; both kinds of punishment fall within the scope of the constitutional prohibition. U.S. Constitution Art. I, Sec. 9, Cl. 3 (as to Congress); Art. I, Sec. 10 (as to state legislatures)." Unfortunately, this prohibition is being systematically violated in many ways. The following links are to discussions ofsuch violations and what is being done to remedy the situation. When law becomes a game only lawyers can play, only lawyers can win. J.A.I.L. 4 Judges — One approach to holding judges accountable for their conduct..
J.A.I.L. South Dakota — Initiative currently before the voters.